Student numbers at the University of New England have reached new heights, with current numbers reaching 20,000. The Chancellor of UNE, Richard Torbay, welcomed the news, saying that never before in its 58-year history had the University had this number of students. “This achievement is on the back of growth in student load of more than 20% over the past three years,” Mr Torbay said. The Vice-Chancellor, Professor Jim Barber, said that this achievement would not have been possible without the hard work and dedication of UNE’s staff. “Our excellent teaching quality and great student support staff, coupled with industry-relevant courses and innovative use of online technology, are all factors in UNE’s reaching this milestone,” Professor Barber said. “This achievement comes as UNE once again maintained its unrivalled record for graduate satisfaction in the Good Universities Guide,” he said. “In its 2013 edition, released last week, UNE gained five-star (maximum) rating for overall student satisfaction – a rating we have received for 13 out of the past 14 years. “UNE’s record for ‘five-star’ student experience sets it apart from other universities. The 20,000th currently enrolled student, Aaron Montgomery (pictured here), has chosen to study (part-time externally) for a Bachelor of Psychological Science degree. “I chose UNE because their flexible study options fitted in with my busy lifestyle,” Mr Montgomery said. At an event in Parramatta overnight, Professor Barber and Mr Torbay presented Mr Montgomery with a certificate, merchandise, and a $1,500 Apple Store voucher to assist him prepare for his studies at UNE. 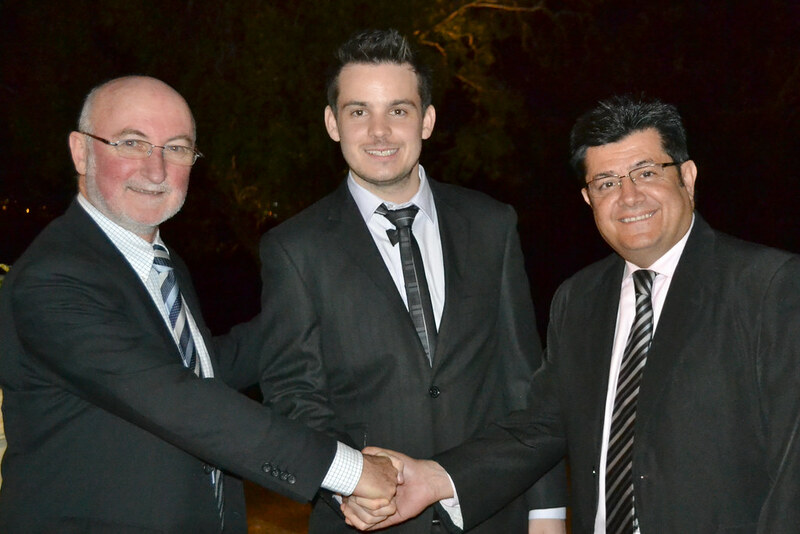 THE PHOTOGRAPH of Aaron Montgomery displayed here expands to show him being congratulated by UNE’s Vice-Chancellor, Professor Jim Barber (left) and the Chancellor, Richard Torbay.